This book is written out of two firmly held convictions. The first is that the Bible is the Word of God. There was a time when the meaning of that statement would have been absolutely clear and incapable of being misunderstood, but in these days words are being twisted and interpreted to mean almost anything. However, as the author explains, he is totally persuaded that in the form in which they were originally written, every word of the Bible’s sixty-six books was ‘breathed out by God’ (2 Timothy 3:16). His second conviction is that Christians are meant to enjoy the Bible. It is meant to be a constant means of enlightenment, enrichment and encouragement, its dynamic influence bringing a deepening joy into our daily lives. Sadly, many Christians seem to fall short of that experience. They read the Bible, perhaps regularly, but if they were to be absolutely honest about their reading they would have to confess that the whole business has become a duty rather than a delight. Others have got into a rut over the method they use for studying the Bible, with the result that they are becoming bored rather than being blessed. However, this is not basically meant to be a rescue operation. 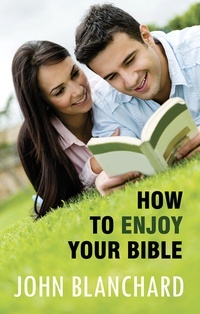 It is written by an ordinary Christian to other ordinary Christians, explaining very simply from his own study and experience why and how we can enjoy the Bible and find it to be a daily source of spiritual power.